I'm very happy to announce that one of my short stories, The Tail of the Sea Upon the Thief's Path, has been published in Aphelion Magazine - The Webzine of Science Fiction and Fantasy. This is my first story to be published in 2016 and I hope it signals more sucess to come in the following months. With my darling daughter turning one last month things have certainly calmed down, the sleep has returned and with that my sanity! Now I have more time to do what I love- writing! 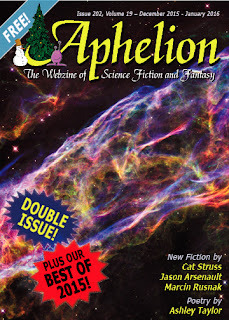 Aphelion is a great magazine and if you've never read it before I suggest you give it a go, issues are free to read online and are packed with top quality stories and poetry. Jack once made a solemn and binding promise, except now he can't remember his pact, he'll say anything to get what he wants. But when he arrives back in the lawless town of Torrpoint there's the constant sound of bells ringing. No one knows where the sound comes from or what it means. What and who are they ringing out for?